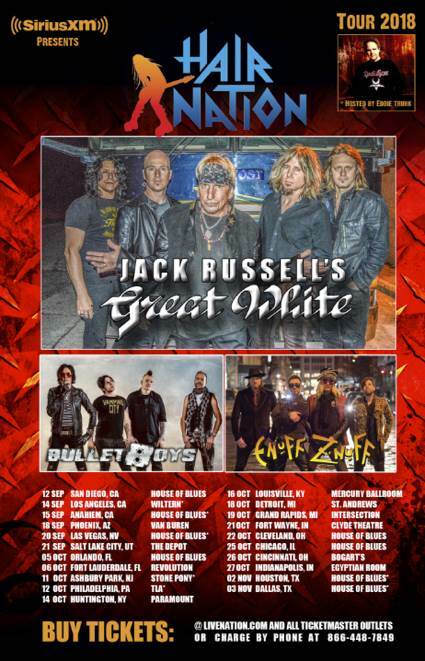 SiriusXM and Live Nation will present the "Hair Nation" tour featuring JACK RUSSELL'S GREAT WHITE, BULLETBOYS and ENUFF Z'NUFF. The 21 city U.S. trek will kick off September 12 at House Of Blues in San Diego. The tour offers listeners and music fans across the country the chance to see the bands who have been giving us decades of larger-than-life rock music. The tour will be hosted by music industry veteran, author and SiriusXM host Eddie Trunk, who will be appearing in person at some of the tour dates. One of the most respected personalities in all the worlds of rock music, Trunk has achieved widespread acclaim as a broadcaster and interviewer on radio and television. Eddie Trunk's "Trunk Nation" show airs on Hair Nation (SiriusXM channel 39) as well as on Volume (SiriusXM channel 106). SiriusXM listeners will have the opportunity to purchase tickets on June 6 before they go on sale to the general public. Tickets go on sale to the general public starting June 8 at 10:00 a.m. local time at LiveNation.com. JACK RUSSELL'S GREAT WHITE features former GREAT WHITE singer Jack Russell alongside former GREAT WHITE bassist-turned-guitarist Tony Montana (as a guitar player and keyboardist), Dan McNay (MONTROSE) on bass, Robby Lochner (FIGHT) on guitar and Dicki Fliszar (BRUCE DICKINSON) on drums. 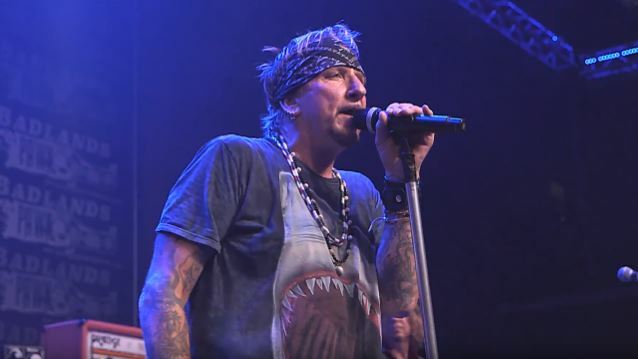 JACK RUSSELL'S GREAT WHITE's debut album, "He Saw it Comin'", was released in January 2017 and featured the singles "Blame It On The Night", "Sign Of The Times" and "Love Don't Live Here". BULLETBOYS' new album, "From Out Of The Skies", was released on March 23 via Frontiers Music Srl. The disc was recorded at the Dave Grohl's Studio 606 in Northridge, California. ENUFF Z'NUFF's most recent album, "Clowns Lounge", was released by Frontiers in December 2016. The record is a collection of rarities and early demos that have been reworked and re-recorded by the band. This exceptional collection also features a guest appearance from the late Jani Lane (WARRANT) as well as an appearance from James Young of STYX.